Doom will be with us in just a few short weeks, and that’s a pretty exciting prospects for fans the godfather of FPS games. But perhaps just as exciting are the easter eggs contain in every level, one of which has been shown off in a new video. 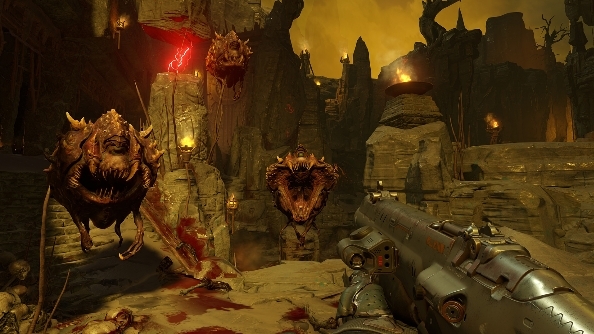 Is there any question that Doom will soon appear on the best FPS games list? Only time will tell. Before you dare press play on the video or read on, do be aware that I’m about to spoil one such easter egg for you. If you plan to head into Doom ‘pure’, then click ‘back’ on your browser now. The video from IGN see’s id Software reveal a hidden level within one of Doom’s areas. Every level in the game will feature a lever that can be pulled to open a door somewhere, and it just so happens that the lever in this video reveals and entrance to a very classic original Doom level. It’s a seamless transition; you simply walk from 2016 graphics into the world of 1993. Your weapons and the demons inside remain in nu-Doom vision, but the walls and pickups are classic 2D pixel images. For fans of the old game, you’ll find that the enemy and pick-up locations are in exactly the same location as they were in the original. The music is just what you remember. This is a true, nerd-out homage to the early days of Doom. And, should you wish to head back in again, any secret area you find can be accessed at any time from the main campaign menu. Are you a big old-school Doom fan? What classic levels do you hope to find hidden away in the new game?